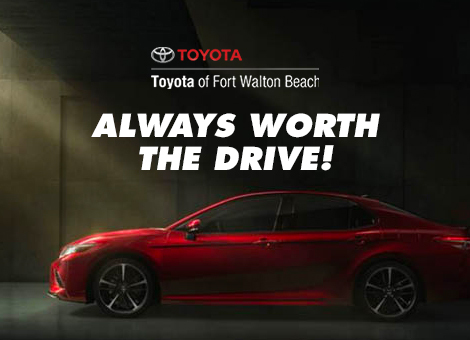 Toyota of Fort Walton Beach invites drivers from throughout the Pensacola, Florida area and beyond to shop and visit our full-service car dealership for all things Toyota. Whether you are in search of the latest Toyota RAV4 or Camry or a pre-owned model, we are sure to have your next vehicle in stock at a competitive price! We have been serving Fort Walton Beach, FL drivers for years with not only new and used cars for sale, but hassle-free financing, genuine Toyota parts and professional auto maintenance. Explore our website to learn more about our many automotive services today! 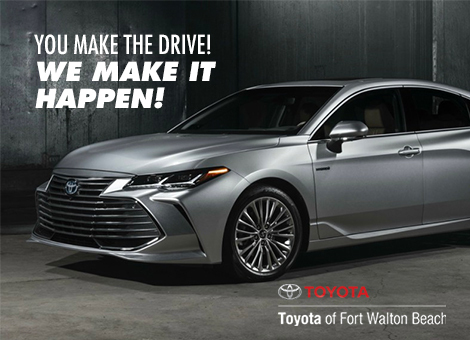 Visit us from nearby Niceville, FL or contact our Toyota team at (850) 863-8344. 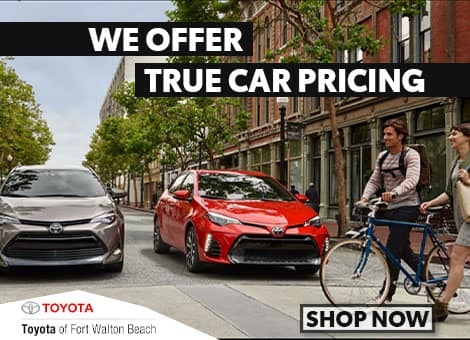 The latest lineup of new Toyota cars, SUVs and trucks are here in stock at Toyota of Fort Walton Beach, from the affordable new Toyota Corolla and Prius C to the roomy Highlander and rugged Tacoma. We welcome local car shoppers to browse our complete new Toyota inventory online now, then stop by our dealership for assistance from our friendly sales associates. 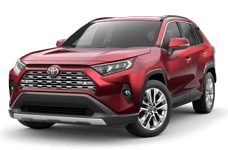 As you shop and compare various new Toyota models here on our website, you can also see our current Toyota lease and finance offers, and even apply for auto loans. A pre-owned Toyota or a used car of another make can provide you with the dependable travels you seek while saving you money, too. We keep our used car lot filled with pristine, late-model examples of popular used vehicles for sale, including Toyota certified pre-owned (CPO) models that boast an extended factory warranty and other perks. Your Toyota, new or old, deserves to be treated to genuine Toyota parts at the hands of factory-trained technicians. You will find that and much more when you visit the Toyota of Fort Walton Beach service center! We employ highly skilled service techs that hold a range of certifications to not only work on Toyota vehicles, but other makes, too. We are located just a short drive from Pensacola, so stop by our full-service dealership today! 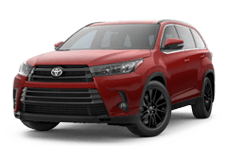 Why Buy at Toyota of Fort Walton Beach? At Toyota of Fort Walton Beach, we are here for our customers from the moment they inquire about a new or used Toyota and the financing they need, through the entire ownership process, including any future routine maintenance needs. With our Toyota Express Maintenance services, your vehicle can enjoy high-quality service at the right price -- right now! No appointment is required for our quick oil and filter changes, brake inspections, tire rotations, fluid checks and more, so stop by whenever is most convenient for you. We are proud to serve our community by investing in nonprofit causes and events. During your short wait here at our dealership and service center -- whether for maintenance or to shop for a new car -- you can partake in a complimentary beverage from our customer lounge.